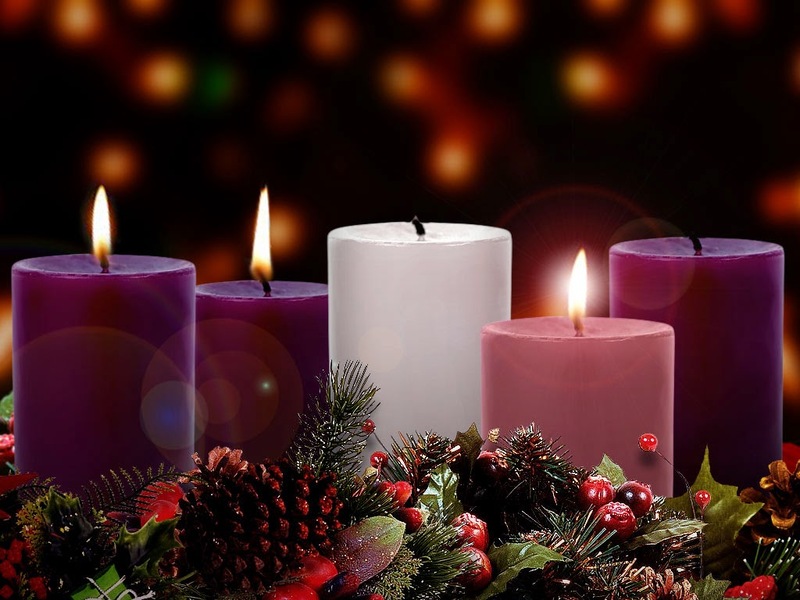 Light the third candle on your family Advent wreath. Following tradition, the third candle is rose-colored as we celebrate "Gaudete Sunday." On this day, in many Latin American communities Las Posadas begin– reenactments of the Holy Family's journey to Bethlehem. Did you know that the nine-day novena represents the nine months of pregnancy, specifically the pregnancy of Mary carrying Jesus? and in Jesus Christ you provide welcome refuge for all in need. we beseech you to provide them a safe haven. and lead them to a place of safety. Be with all those in need with your power to save. Read the First Lesson in our Festival of Lessons & Carols. Begin including the "O Antiphons" as part of your table or bedtime prayers. Read the Second Lesson in the Festival of Lessons & Carols. Set up your Christmas tree, but in true Advent spirit, don't decorate and light it until Christmas Eve. Put up and bless the family crèche. Remember to hide the Baby Jesus figure until Christmas! Read the Third Lesson in the Festival of Lessons & Carols. Read about the virtue of hope in the E-pub version of the Catechism of the Catholic Church (enter "1819" in the search window) and reflect on its particular relevance to the season of Advent. Participate in a community caroling party or sing a favorite Christmas carol at home. Read to the Fourth Lesson of the Festival of Lessons & Carols. In The Joy of the Gospel, Pope Francis's post-synodal apostolic exhortation to 2012's Synod of Bishops on the New Evangelization, which was released just before Advent, the Holy Father calls for renewal and rethinking of the way every person and every institution of the Catholic Church — from the pope and the Roman Curia down to the parish and its parishioners — live their faith and focus their energies. Read the exhortation. . . and reflect on how you can embrace the pope's teaching and improve your relationship with God. Today's O Antiphon beseeches the Lord to "free the prisoners of darkness." Pray today for all prisoners and read the U.S. Bishop's statementResponsibility, Rehabilitation, and Restoration: A Catholic Perspective on Crime and Criminal Justice. Pray also for those who have been victims of crime, especially those that are known to you. Make it family movie night and watch a Christmas classic together. Choose one from this list of suggestions.